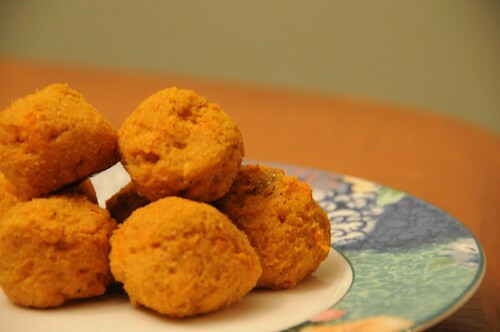 The most brilliant quality of these sweet potato falafel is their taste, of course, but the second most brilliant quality is that they’re the kind of food that seems fancy but is actually really easy to make. I also love the savoriness of this dish. Too often sweet potatoes get relegated to glazed preparations, but they play well with these Indian-inspired spices too. Preheat the oven to 425 F. Wash the sweet potatoes thoroughly (I like to use a dish brush with no soap) and pierce the skin several times with a fork or paring knife. Roast the sweet potatoes whole — you can put them directly on the rack — until tender. This will take at least 45 minutes, but could be up to a bit over an hour; bamboo skewers made for kebabs are great for testing to make sure the center is cooked through. Remove the potatoes from the oven, chop them in half, and let them cool until you can handle them. Turn the oven temperature down to 400 F while you wait. When you can pick them up comfortably, squish the flesh out of the potatoes (I find squeezing them like toothpaste tubes easiest) and into a bowl. The flesh closest to the peel won’t come out, which is fine: it’s usually more fibrous anyway. Alternately, you can scoop them out with a spoon, but be careful: the skin is fragile. Add the garlic, curry powder, garam masala, chickpea flour, and salt and pepper to the potatoes and mash until there are no more big chunks of potato. Taste it — if you’re into spicy, you might want to add more curry or garam masala. 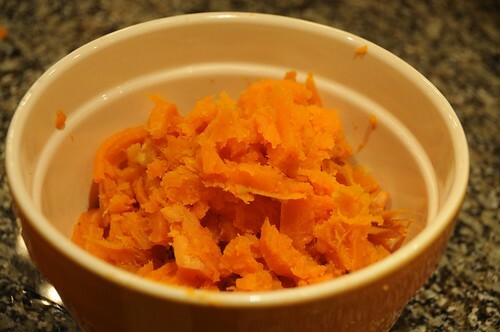 The mixture should be moist but not very sticky; if it’s too sticky (sweet potato water content can vary a lot), add an extra tablespoon of chickpea flour. Lightly oil a cookie sheet with olive oil. You can use spoons or a scoop to shape the falafel, just plunk them down in mounds (still completely tasty! ), or scoop bits up with your fingers and roll them between your palms to make them more uniform in appearance, as I did here. Bake for 15-20 minutes, until the bottom turns golden brown and the top no longer looks wet. 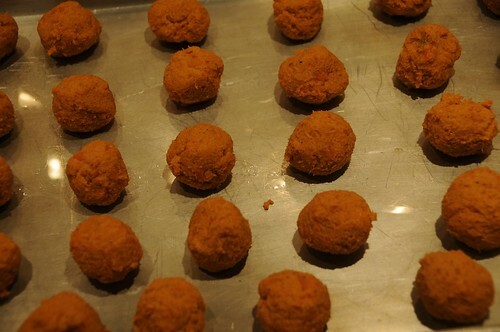 Makes 18-20 falafel, which is enough for three servings as a main dish or four to six as a side; it doubles well! *There is a lot of confusion in the U.S. about sweet potatoes versus yams. In this case, you want something with orange flesh, no matter what it’s sold as! **I use the Sweet Curry Powder from Penzeys because I want flavor more than heat. Curry powder is one place where it’s worth not just buying the grocery store version, but also one highly subject to personal taste! ***The best garam masala comes from an Indian grocery store; if you don’t have one in your area, you can buy from one online or — of course — from Amazon. ****This is easy to find at Indian groceries and at some regular grocery stores. Health food stores are another reasonable bet, as it’s sometimes marketed to gluten-free folks. Failing all else, again with Amazon.